What is the difference between IBEX and NYU Study Away? With IBEX, you enroll directly at a leading international business school and take classes with students from around the world. You earn course credits that transfer back to NYU, allowing you to stay on track with your curriculum. With NYU Study Away, you attend classes at an international NYU campus with other NYU students. You earn NYU credits that also allow you to stay on track with your curriculum. When should I start making plans to study away on IBEX? It is important to meet with an Academic Adviser as early as possible in your academic career to discuss your interest in the IBEX program. The earlier you begin planning, the more options and flexibility you will have. In addition, the Important Dates & Deadlines page is another useful planning tool. It outlines the IBEX process - from applying to preparing for departure. One application process is held per academic year for IBEX, and you must apply approximately one year in advance. If you are interested in going abroad through IBEX during Summer 2019, Fall 2019 or Spring 2020, you may apply via the online IBEX application due by Tuesday, November 6, 2018 at 12:30PM EST. All of the IBEX partner schools offer course work in English as well as in their native language. Most Stern students complete coursework in English. It is helpful to have some background in French for Sciences Po, HEC Paris and Universite Paris Dauphine; likewise, it is helpful to have some background in Korean for Yonsei University and Mandarin for Peking University. If you are interested in taking your course work in a language other than English, the partner school may ask you to demonstrate your language proficiency through an examination or other documentation. Is there a minimum GPA requirement to apply to the IBEX Program? There is a 3.0 minimum GPA requirement for students who wish to apply to study abroad. What if I don't meet the minimum GPA requirement? Students with a GPA below 3.0 can still apply to IBEX. These applicants may be asked to meet with an International Exchanges & Special Programs staff member and/or Academic Adviser to discuss academic needs and expectations. Preference is given to candidates with a 3.0 or above, but candidates with a GPA below 3.0 may be given a conditional acceptance should space remain. Can I study abroad in either the Fall or the Spring semesters? Both semesters are available for the IBEX study abroad program. You can study abroad in the Fall or Spring semesters of your Junior year or in the Fall semester of your Senior year. Most schools are available for both semesters, but may have start and end dates that differ from that of NYU. When researching which IBEX school you would like to attend please make sure to note the specific term dates and make sure they work for you. If I am abroad how will I get an internship for the summer since I will miss the recruitment period? Students have conducted research on internships prior to studying away. They have contacted companies prior to leaving to let them know why they will not be present during the recruitment period. Some students have also conducted phone/Skype interviews while they were abroad. The key is to be proactive and network. Talk to Stern students who recently returned from studying abroad on IBEX, as well as the Wasserman Center for Career Development to get additional information and advice about internship recruitment prior to studying abroad. After you return, you will be able to market your unique IBEX experience and skills during interviews. Visit IBEX and Your Career for more information on how to make the most out of your time abroad. What will the housing be like at the university I am attending? The housing situation varies for each university. Students live in residence halls or live off campus in apartments. You can find descriptions of housing options on the partner schools' exchange program websites or on the IBEX Partner Schools pages. Once accepted into the program you will be put in contact with your host school to discuss the various housing options. Stern students who have recently returned from an IBEX semester are also a good resource. Generally anywhere between one and eight students are selected to attend each of our 18 partner schools. How will my tuition and financial aid work while I am studying on IBEX? Your tuition costs and financial aid will remain the same while on IBEX. Tuition will still be paid directly to NYU. Housing costs will be paid abroad (not to NYU). You can find more information at Tuition, Housing and Other Logistics. Students who have questions about their financial aid while abroad should consult the NYU Office of Financial Aid. What classes can I take on IBEX? The courses you take on IBEX will depend on the partner school you attend and your own concentration(s) and minors. You will meet with both an Academic Adviser and an International Exchanges & Special Programs staff member to plan your courses before departure. All schools offer coursework in English. You must plan to take at least two electives (between 6-8 NYU credits). You can also take a maximum of two courses per concentration while on IBEX (however you cannot take any Accounting courses abroad). You should review the list of approved courses for your IBEX Partner School and talk to Stern students who have studied there in the past. For students studying abroad on IBEX in the Fall, most partner schools do not post their confirmed classes until June or July. You will have time to drop/add courses once you are abroad. Will the grades I earn on IBEX factor into my Stern GPA? Although letter/numeric grades are earned abroad, classes taken while on IBEX transfer back to your NYU Stern transcript as pass/fail. Passing grades will not affect your Stern GPA, however a failing grade will factor into your Stern GPA. If you fail a class it will be transferred back as a fail and cannot be waived or omitted from your NYU transcript. Please note: You will receive an official transcript from your IBEX school that will list your classes and your actual grades - along with their grading scale. You will be able to show this transcript to any graduate school or employer who requests more information about your academic performance while on IBEX. I have a specific question about a school or class. Who can I talk to? 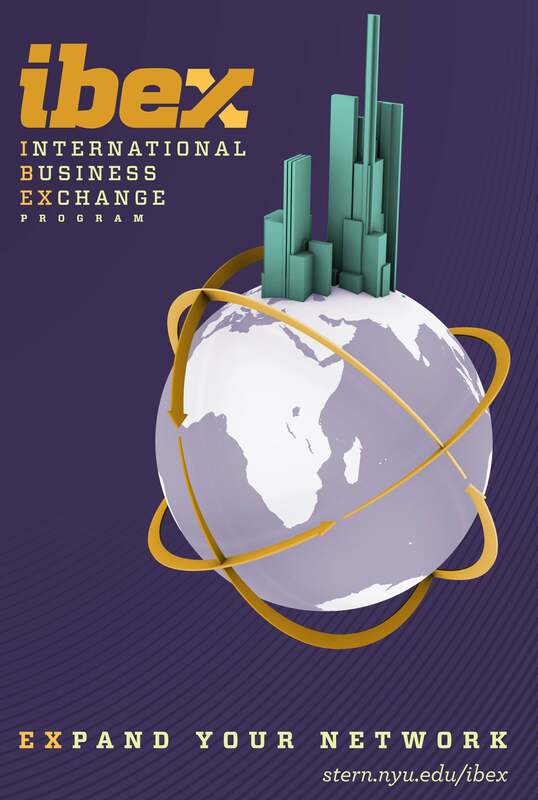 You can contact Stern's International Exchanges and Special Programs or speak with an Academic Adviser. Additionally, you can speak with an IBEX Ambassador who are students who have recently returned from a semester abroad at one of our partner schools and are willing to talk about their experiences with you, by contacting International Exchanges and Special Programs. Stern only accepts exchange students through formal agreements with our partner schools abroad. Otherwise, admission into the Stern School of Business Undergraduate College is handled through New York University's Office of Undergraduate Admissions.